Bottled water has been a big-selling commercial beverage around the world since the late 1980s. 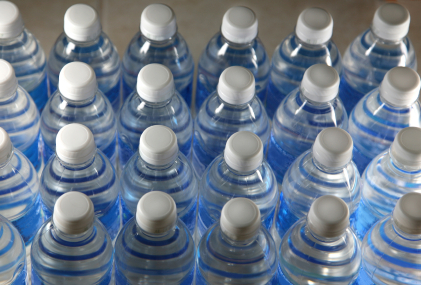 According to the Worldwatch Institute, global bottled water consumption has more than quadrupled since 1990. Today Americans consume over 30 billion liters of water out of some 50 billion (mostly plastic) bottles every year. The Beverage Marketing Association reports that in 2008 bottled water comprised over 28 percent of the U.S. liquid refreshment beverage market. The only bottled drinks Americans consume more of are carbonated sodas like Coke and Pepsi. And frankly, yes, it is a ridiculous waste that we obtain so much of our drinking water this way when it is free flowing and just as good if not better for you right out of the tap. According to the Earth Policy Institute (EPI), some 2.7 million tons of petroleum-derived plastic are used to bottle water around the world every year. “Making bottles to meet Americans’ demand for bottled water requires more than 1.5 million barrels of oil annually, enough to fuel some 100,000 U.S. cars for a year,” says EPI researcher Emily Arnold. And just because we can recycle these bottles does not mean that we do: The Container Recycling Institute reports that 86 percent of plastic water bottles in the U.S. end up as garbage or litter. The financial costs to consumers are high, too: According to the Environmental Working Group (EWG), bottled water costs up to 1,900 times more than tap water. And the Natural Resources Defense Council (NRDC) reports that 90 percent or more of the money consumers shell out for it pays for everything but the water itself: bottling, packaging, shipping, marketing, other expenses—and, of course, profits. EWG is particularly appalled at the lack of transparency by leading bottled water sellers as to the sources of their water and whether it is purified or has been tested for contaminants. According to a recent survey by the group, 18 percent of the 173 bottled waters on the U.S. market today fail to list the location of their source; a third disclose nothing about the treatment or purity of the water inside their plastic bottles. EWG recommends that consumer resist the urge to buy bottled water and go instead for filtered tap water. “You’ll save money, drink water that’s purer than tap water and help solve the global glut of plastic bottles,” the group advises, adding that it supports stronger federal standards to enforce consumers’ right to know about what’s in their bottled water besides water. Until that day comes, concerned consumes should check out EWG’s Bottled Water Scorecard, a free website that provides information on various bottled water brands, where they originate and whether and how they are treated to remove contaminants. EarthTalk® is written and edited by Roddy Scheer and Doug Moss and is a registered trademark of E – The Environmental Magazine (www.emagazine.com). Send questions to: earthtalk@emagazine.com. Subscribe: www.emagazine.com/subscribe; Free Trial Issue: www.emagazine.com/trial.